Crazing is generally associated with spas, but could occur on bath products. For example, crazing occurs on bathtubs, showers, and sinks made with either FRP (polyester resin reinforced with fiberglass) or cultured marble. Go to the "Surfaces" tab and "Plastic Surfaces" category to learn more about these materials. Crazes form at highly stressed regions associated with scratches, flaws, stress concentrations and molecular inhomogeneities. The type of stress involved with surface crazing is most usually a tensile stress, and the micro-cracks generally propagate perpendicular to the applied tension. However, crazing can occur due to thermal stresses as well. Thermal stresses are induced due to expansion and contraction from temperature changes. This is the primary cause of crazing in gelcoat products. In most situations, total stress is comprised of both mechanical and thermal stresses. Crazing occurs mostly in amorphous, brittle polymers like polystyrene (PS), acrylic (PMMA), and polycarbonate (PC). 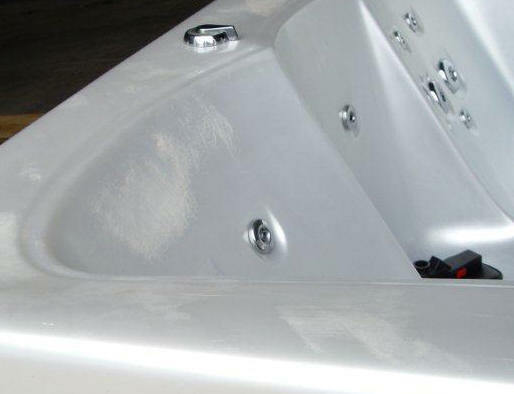 The acrylic used for spas is specially designed to withstand the normal spa environment, but it will fail under harsh conditions. Many studies by an acrylic manufacturer have demonstrated that two conditions must be present for stress crazing to occur on an acrylic spa surface. This may be due to the fact that acrylic used for spas is crosslinked, and therefore requires more energy to separate the molecules. The two conditions are . . .
presence of an aggressive stress-cracking chemical. The presence of only one of these conditions would not cause crazing. Crazing appears as very small micro-cracks that look like a spider web on the acrylic surface. The stress tends to pull apart the tightly coiled polymer chains. This condition makes it easier for solvent molecules to penetrate the molecular structure of the acrylic and diffuse throughout the polymer chains. The solvent molecules act as a lubricant, which permits the polymer chains to separate from one another, creating very small cracks. Depending upon the amount of stress and the aggressiveness of the environment (i.e. chemical solvent), the small cracks continue to grow in size. Styrene is one of the components of polyester resin reinforcement systems. It should be consumed in the polymerization process. However, in some instances there is residual styrene left in the composite structure. Since styrene is a strong stress cracking agent, it has been a common cause of crazing in an acrylic spa. However, chemical analysis must be used to definitely determine the cause of crazing in a specific sample. See pictures below for an example of typical crazing on an acrylic spa surface. If observed with magnification, one will see tiny micro-cracks throughout the area. It is highly recommended to use a spa cover to minimize the risk of crazing in an outdoor spa. See the following link: "Why Use a Spa Cover?" 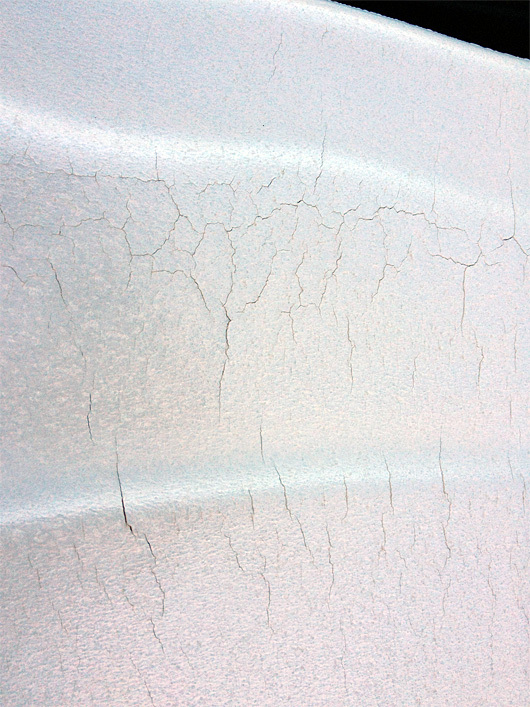 In gelcoat/FRP products, crazing, often called "alligatoring," appears as a random pattern of fine cracks in the gelcoat. 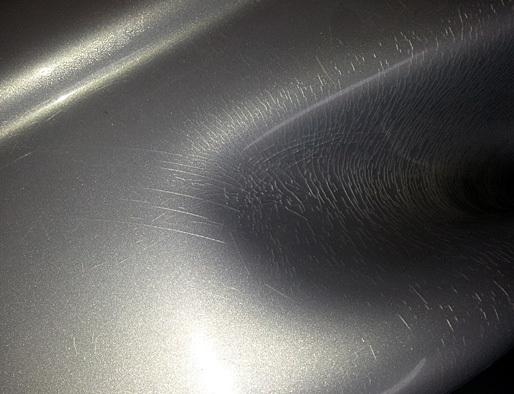 A thick gelcoat resists flexing, becoming increasingly brittle over time, and temperature fluctuations between hot and cold cause expansion and contraction. Also, chemicals can weaken the gelcoat resin. These forces cause the molecules in the resin to separate, and lead to small cracks. 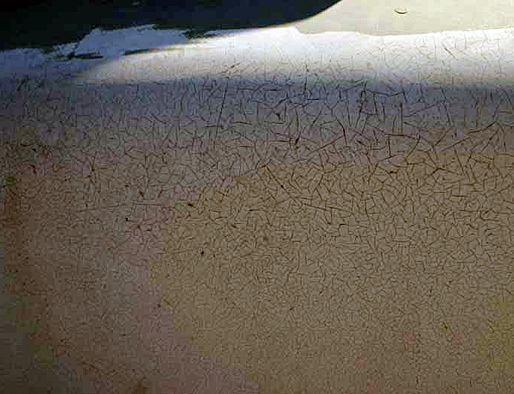 Affecting only the coating, gelcoat crazing is easier to repair than problems affecting the FRP structure.